So what do you do for a baby shower where the mom-to-be doesn't want anything too cutesy? 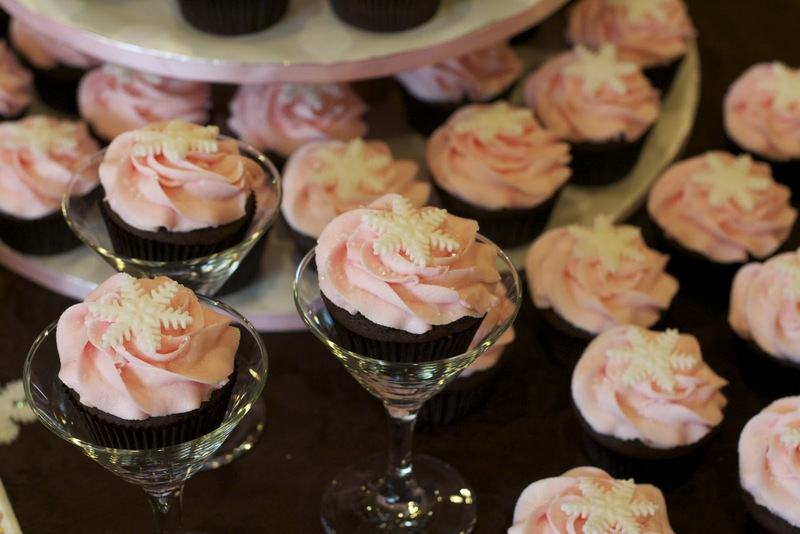 As this baby girl is expected to arrive in January, the baby shower had an elegant snowflake theme including these cupcakes. 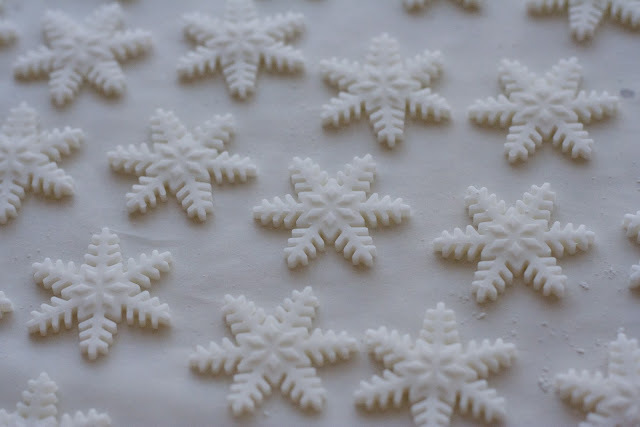 Originally I thought about piping the snowflakes with royal icing on parchment for topping the cupcakes, but I thought that it might be a bit too finicky and may result in a lot of broken snowflakes and one frustrated baker. I ended up buying a snowflake plunger by PME Arts and Crafts and I was very happy with the results. I used fondant with a little tylose powder added in to make a modelling paste as it sets harder. The cupcakes are a devils chocolate with vanilla frosting. 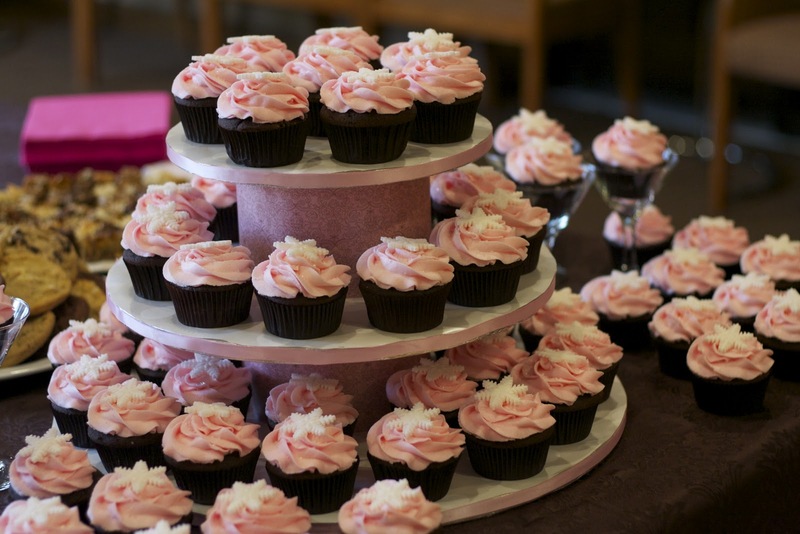 The cupcakes are extremely light and fluffy in texture and deliciously chocolatey. I used regular Dutch-processed cocoa but would love to try using an extra dark cocoa to get an even darker/richer brown. I haven't made frosting for a while and my last baking expedition was using swiss meringue buttercream (SMB). I must say, I may be switching camps here when it comes to icing (don't tell my husband). The flavour of a sugary frosting on a cupcake is delightful and nostalgic, however for those whose palates have an equal appreciation for lovely textures, you cannot beat the SMB. The frosting ends up having a bit of a gritty texture from the icing sugar which is reduced slightly after it sits for a bit but is still detectable. 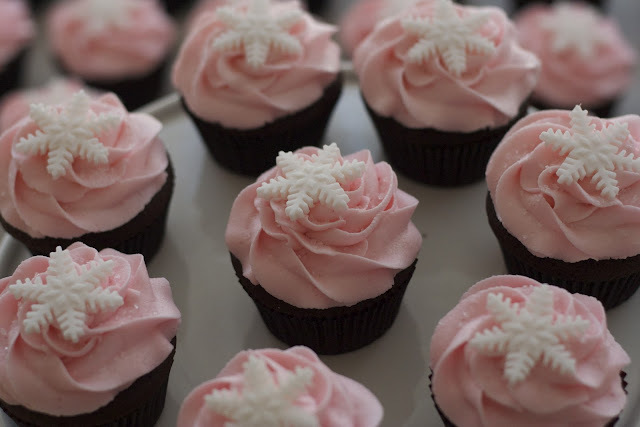 I topped each pink-frosted cupcake with some course icing sugar for a snow-like effect as well as a fondant snowflake. Now while making these 3 batches of cupcakes and 4 batches of frosting, I noticed that my KitchenAid Professional 6-quart mixer was showing signs of being on the fritz i.e. shaking more than it should at a speed of 2 and motor oil dribbling down the back. I choose not to panic. My husband and I have an agreement that if anything should ever happen to the stand mixer, we would promptly replace it. Whew. After a telephone consultation with my father (he seems to be able to fix absolutely anything), it sounds like something may be loose in the motor. I am now anxiously awaiting his arrival to see if this can be fixed before my next baking project. Now to display these pink winter wonderland cupcakes, we (my sister-in-law and I) made a cupcake stand using three cake drums and two 4-inch high styrofoam dummies. We covered the drums in a white polk-a-dot wrapping paper, covered the edges in pink ribbon (just a smidgen too narrow for these drums unfortunately) and wrapped the dummies in pretty pink and brown paper that was also used for the invitations. I was quite happy with the overall display.